Synthetic peptide within Human gamma Tubulin aa 1-100. The exact sequence is proprietary. Hela, Jurkat, A431 or 293 lysate, Human colon tissue or Jurkat cells. Our Abpromise guarantee covers the use of ab180595 in the following tested applications. WB 1/1000 - 1/2000. Detects a band of approximately 48 kDa. Heat up to 98 °C, below boiling, and then let cool for 10-20 min. Tubulin is the major constituent of microtubules. Gamma tubulin is found at microtubule organizing centers (MTOC) such as the spindle poles or the centrosome. Pericentriolar matrix component that regulates alpha/beta tubulin minus-end nucleation, centrosome duplication and spindle formation. Phosphorylation at Ser-131 by BRSK1 regulates centrosome duplication, possibly by mediating relocation of gamma-tubulin and its associated proteins from the cytoplasm to the centrosome. Cytoplasm > cytoskeleton > centrosome. Immunohistochemical analysis of paraffin embedded Human colon tissue labeling gamma Tubulin with ab180595 at a 1/100 dilution. 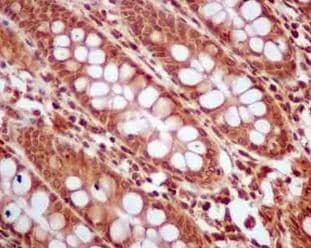 Prediluted ImmunoHistoprobe HRP Polymer for Rabbit IgG secondary used. Counterstained with Hematoxylin. 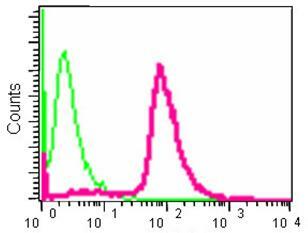 Flow cytometry analysis of Jurkat cells using ab180595 at a 1/140 dilution (red) or a rabbit monoclonal IgG (negative) (green). 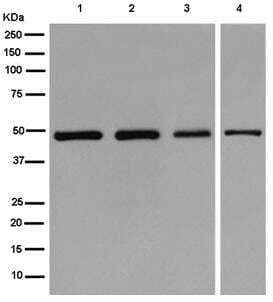 Goat anti rabbit IgG (FITC) secondary used at a 1/150 dilution. Publishing research using ab180595? Please let us know so that we can cite the reference in this datasheet.